But despite lots of interest in mahseers, their future is under serious threat as their rivers become polluted and blocked by hydropower dams in order to support a rapidly growing human population. Those fish that do survive are vulnerable to illegal “dynamite fishing” in which a blast kills or injures all aquatic life, allowing poachers to harvest anything that floats to the surface. Of the 18 currently valid species of mahseer, the official IUCN Red List of Threatened Species currently lists four as endangered, one as vulnerable, and one as near threatened. The rest either lack enough data to reach a conclusion or haven’t been evaluated. Recent research published by colleagues and I in PLOS ONE focused on the hump-backed mahseer, the largest and most endangered of all mahseers. The fish was once common throughout the Cauvery river and its various tributaries in southern India, but it is now limited to just a handful of small isolated populations. Weighing as much as a small adult human (55kg), this freshwater giant qualifies as megafauna, yet bizarrely it has remained a taxonomic enigma without a valid scientific name. 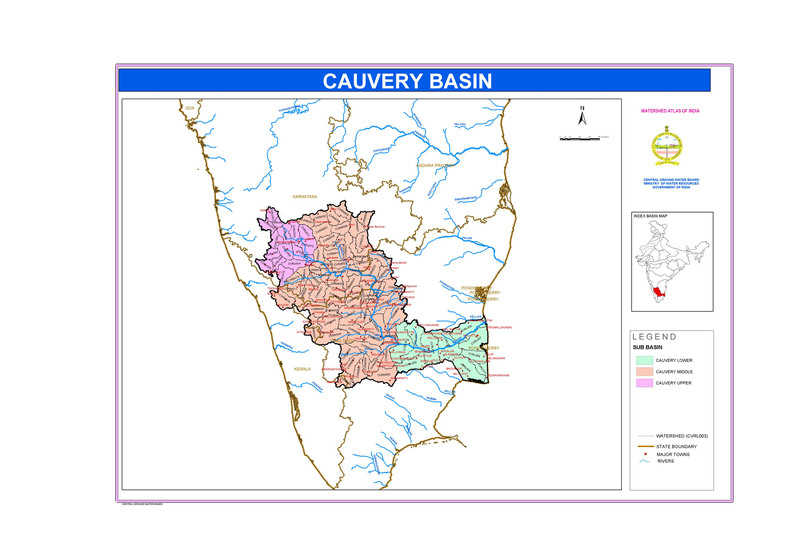 The Cauvery and its tributaries flow through the states of Karnataka, Kerala and Tamil Nadu. Until now. Colleagues and I discovered that the hump-backed mahseer is actually the same species as Tor remadevii: a mahseer that previously lacked a common name. Scientists first described Tor remadevii as a new species in 2007, based on a small sample of juvenile fish from the most southerly tributary of the Cauvery catchment in the state of Kerala. Little did they realise that the small fish they had discovered from this remote sub-catchment was the same as the monster mahseer found in the upper and middle reaches of the main river Cauvery. The hump-backed mahseer was first brought to the attention of the world’s anglers in Henry Sullivan Thomas’s 1873 classic, The Rod in India. During British rule, several huge specimens were recorded, including the still-standing world rod-caught record, a 120lb (54kg) monster captured in 1946 by a taxidermist from Mysore known as de Wet Van Ingen. Indian independence followed soon after, and the mahseer was largely forgotten by the outside world, with many believing the fish had been dynamited to extinction. Although larger fish have been reported, this catch by de Wet Van Ingen still stands as the official world record. That was until 1977, when the Trans World Fishing Team – comprised of three Englishmen –travelled to India and spent several months exploring the country’s rivers before reaching the Cauvery. 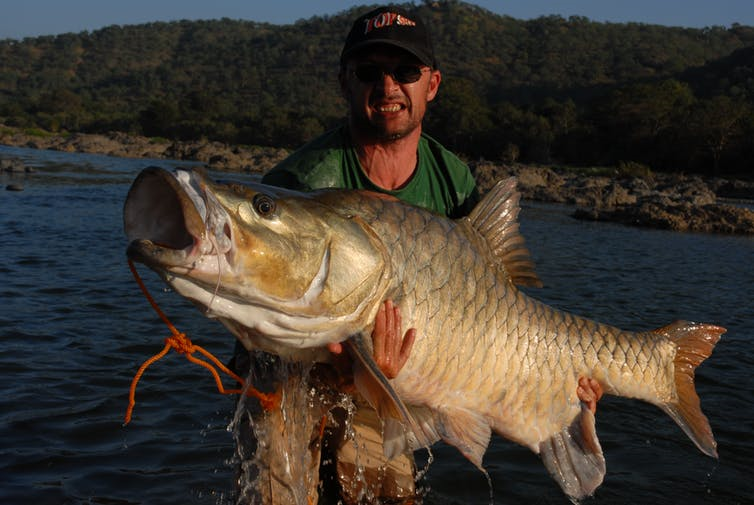 There they found the hump-backed mahseer very much alive, and realised their sporting dreams by recording individual catches up to 92lbs (42kg). This reignited global interest, and catch-and-release anglers from around the world flocked to the River Cauvery in search of the legendary fish. Local villagers found employment as angling guides, cooks or drivers, some of them rehabilitated poachers who realised that a live mahseer had renewable value, unlike the single value of a dead one at market. Patrols were set up to protect the species 24/7, allowing the ecology of the river to flourish. Martin Clark of the Trans World Fishing Team with one of the fish caught in 1978. But all was not what it seemed. Since their establishment in the 1970s, the angling camps had been collecting invaluable data which shed new light on the situation. When colleagues and I analysed these detailed catch records, we realised the hump-backed mahseer had almost disappeared. Although overall mahseer stocks were rising, the humpback itself was being rapidly replaced by a non-native and highly invasive species of mahseer, which had been deliberately introduced to the River Cauvery to boost stocks in the late 1970s. This led us to publish a paper in 2015, outlining the threat of imminent extinction facing the hump-backed mahseer. The hump-backed mahseer has been known around the world by its common name, but confusion over its scientific name has prevented its inclusion in the IUCN Red List of threatened species. Given the fish is on the edge of extinction, it proved a significant challenge finding wild specimens from which to collect the DNA and associated evidence required to support a formal taxonomic clarification. Only after three years of expeditions was our team finally successful in finding a small population of humpbacks in a remote jungle section of the River Moyar, a tributary of the Cauvery. The paper we recently published fixes the scientific name as Tor remadevii and should see the iconic species assessed as “critically endangered” in the next update of the Red List. The significance of the research published will afford this iconic fish the recognition and legislative protection it so urgently requires to develop robust conservation planning. However, in the long term, the fish’s future rests in the hands of the three Indian states with stakes in the highly-contested Cauvery river system – Tamil Nadu, Kerala, and Karnataka. One hope is that the humpback mahseer will become a unifying force and bring these states together to protect the rich biodiversity and natural function of the Cauvery from further decay, allowing the river to continue to support the many millions of people who depend on it.